I've got 2 cards today, both using Catherine Pooler inks and stamps. The first is for this week's Color Throwdown challenge. I used the faux watercolour technique (ink up the stamp then mist with water before stamping) to create my 'watermelon slices'. I love how they have almost a tie-dye look! Next, another card for this week's Muse challenge. I turned Tracey's layout on its side and used a rainbow of feathers and a die cut sentiment. LOVE both of these, Ardyth! I am especially drawn to the rainbow feathers. ;) Love me a rainbow! I came over to tell you how much I loved your Muse feathers but found your melons...wow! The melons are fabulous! Bright, beautiful, fresh, crisp, and cheery--all words that come to mind when seeing your card! Jeeze...I'd love to live in your creative brain for just a day. Fabulous cards. I am seriously loving your takes on this weeks Muse. Love your circles - so fresh. And always up for a rainbow card. Ardyth both are just amazing, those CP inks are so vivid just wow! Love those medallions for CTD and the rainbow of feathers are simply gorgeous. Should have played with your ink the other day! 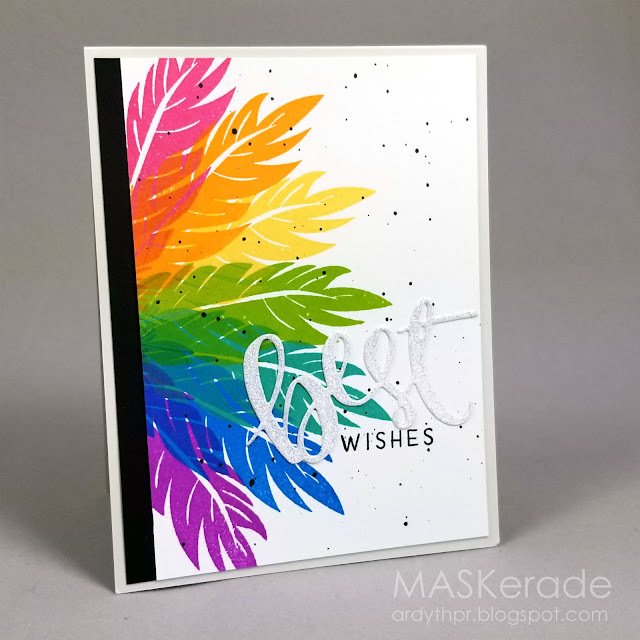 What gorgeous cards Ardyth - love your feather rainbow!! Ack, these are awesome cards! So bold and colorful, but sweetly CAS, too! love these too, those feathers are so brilliant, couldn't decide whether they were feathers or leaves at first so I read the post of course. Beautiful deep colours. Two gorgeous cards, Ardyth! I love the effects of your faux watercolor technique on the first one and your feathers are STUNNING! Beautiful rainbow of colors and your sentiment is perfect! Two gorgeous cards Ardyth! Love the pink and green on the first one!